Check public and restricted holidays in India for the calendar year 2017, declared by the Central Government of India with notification No. – F.No.12/8/2016-JCA-2, Dated 24th June 2016. Central Government offices in Delhi and out-side Delhi are closed on following days during the year 2017. 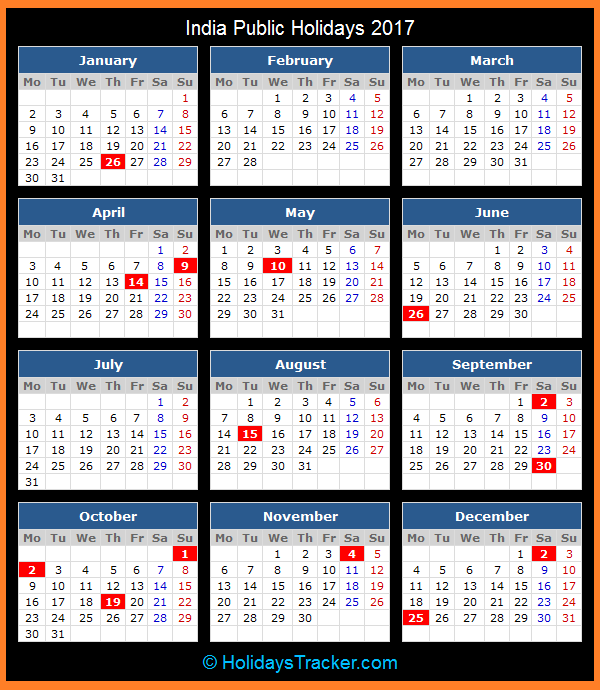 Check dates in 2017 for Republic Day, Maha Shivaratri, Holi, Ram Navami, Mahavir Jayanti, Good Friday, Buddha Purnima, Id-ul-Fitr, Independence day and Id-ul-Zuha. 2017 Holidays List for Central Government Administrative Offices located in Delhi / New Delhi. Note – * Date may be subject to change, depending upon sighting of the moon. Central Government offices located outside Delhi/ New Delhi, observe the following holidays. In addition to above 14 holidays list, each employees can avail another three more holidays from below holidays list. Each employee will be allowed to avail any two holidays to be chosen out of the list of restricted holidays.